Homemade cinnamon rolls are easy to make and super delicious. This recipe calls for rolled oats and whole wheat flour, making the baked goodie just a little bit better for you. Cinnamon Rolls are a regular Sunday morning staple around here. I usually whip up the dough in the bread machine on Saturday night. Then I fill and slice the rolls and let them rise overnight in the fridge. After a few minutes of resting on the counter in the morning, they’re ready to bake and be devoured. Recently I started beefing them up a bit with whole grains. I’ve tried this with both rolled oats and All-Bran cereal which I got for free awhile back with a good sale and coupons. I feel a little better feeding these to my kids, knowing that some of their carbs are a little more complex than plain ol’ sugar. One of the beauties about cinnamon rolls is that you can easily freeze them. 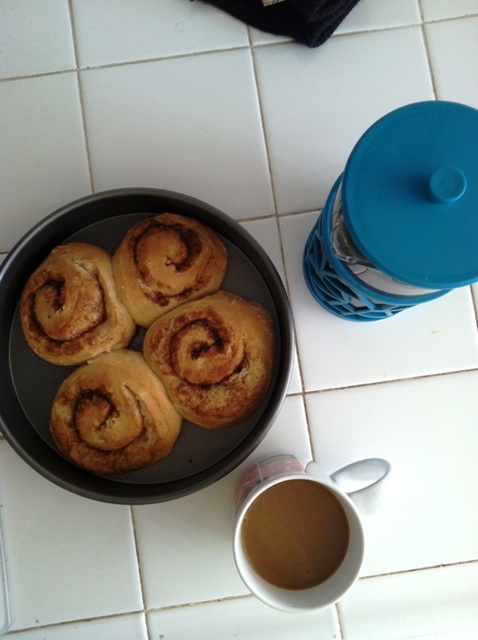 Check out Amy’s great tips for making cinnamon rolls convenient without buying the canned kind. Her brilliance is a game-changer! a bread machine is nice, too. Homemade cinnamon rolls are easy to make and super delicious. This recipe calls for rolled oats and whole wheat flour, making them a little bit better for you. Combine dough ingredients in the bread machine according to manufacturer’s instructions. Use 4 cups of flour to start. Add more flour in case the dough is too wet. Program for Dough and allow the machine to do its magic. If you don’t have a bread machine, you can still make this recipe. Warm the milk slightly and melt the 4 1/2 tablespoons butter in a medium saucepan. As long as the temperature is not above 115 degrees, add the granulated sugar, vanilla, and yeast. Let that rest for 5 minutes. Transfer to a large mixing bowl, then add the flours and salt. Stir until you have a sticky dough but all the flour is incorporated. Turn it onto a floured surface and knead until the dough becomes elastic. Set into a greased bowl and allow to rise until doubled in bulk, about an hour. When the dough is ready, roll out on a lightly floured surface until you have a 12 x 15-inch rectangle. Spread the 3 1/2 tablespoons softened butter over surface. In small bowl, combine the brown sugar and cinnamon. Sprinkle over butter. Roll up dough, jelly-roll fashion, starting from the long edge and pinching the seam to seal. Slice into 12 equal portions and arrange evenly in a greased, 9 x 13-inch pan. You can use unflavored dental floss to neatly cut the rolls. Allow the rolls to rise another 30 minutes before baking. Or you can cover the with plastic wrap and refrigerate overnight or wrap well with foil and freeze. Check this post for more tips on freezing cinnamon rolls. In the morning, remove from refrigerator and allow to rest 20 minutes. Preheat oven to 350°. Bake rolls until lightly browned, about 20 to 25 minutes. Remove from oven and cool on a wire rack. Combine the powdered sugar and 1 to 2 tablespoons milk in a small mixing bowl, stirring with a wooden spoon until combined. Glaze baked rolls with icing. Note: Some readers have had to add up to 1 cup more flour. This may depend on how you measure flour, what combination of whole wheat to unbleached you use, and the humidity in your part of the country. Well, you would follow the traditional way of making bread. Warm the milk, proof the yeast. Add the sugar and butter. Then add the dry ingredients. Stir well. Then knead until a soft dough forms. Do you have a stand mixer? You can do it with the bread hook as well. Does that help? You’re not behind the times. Do what works for YOU! Adding on to this thread. I’m making these for the first time this morning. If I’m suing a stand mixer with a bread hook, does that replace the kneading? or just the mixing?? I’m brand new to bread making. these sound delicious. doing a trial now so I can be ready for Christmas. Yes, using the bread hook in a stand mixer replaces the kneading stage. Just be sure not to overknead. You want to see the strands of gluten that develop in the flour. When you freeze these for future use, do you freeze them before or after you’ve baked them? And if you freeze them before you bake them is it before or after you let them sit overnight in the fridge? And if you have to cook them after you have frozen them how long do they need to sit out before cooking? Can you tell I’m a type A personality? I roll and freeze on trays. Then once frozen, move to freezer bags. Then the night before I serve them, I pull however many I want, let them rise overnight in a greased pan and then bake in the morning. What kind of bread machine do you own? Do you or your readers have any suggestions? I’ve been using an old machine that my mother-in-law gave me for almost 15 years, and recently the results have been getting less and less satisfactory. I took a quick look online earlier this week, but there are so many options and brands to choose from! I immediately became overwhelmed! I could just go to the thrift store and buy the first one I find, but I do use a bread machine at least once a week (usually more), and I think I’d rather have a new one. Any suggestions? I am now on my third machine. I’m not sure if it is because it’s the least expensive model out there or if I just use it a lot. I have had two Osters and a Sunbeam. They’re the same machine, just two different labels. Hope that helps. I think you have the right frame of mind to purchase a new one, even if like Jessica said you get the cheapest one. I’ve seen them at Wal-Mart for around $40 in S. California. I got one from my local thrift store, used it a hand full of times before the heating element wouldn’t cook my loaves of bread properly. Also, when shopping for it, I noticed most of the ones at the thrift store didn’t have owner’s manuals. I’m the person who NEEDS the manual. Some machines work differently and suggest putting ingredients in a certain order for success. Just thought I’d share. So, I was given a bread machine in 1997 because my girlfriend never used it. And I’ve never touched it either. I just googled the manual (as I have, of course, lost it), read it through, and it’s whirring my first batch of cinnamon rolls as we speak. Fingers crossed! It’s been on my to-do list since this post was originally posted! It IS OK to not use bread machine flour, right??? The manual directions said it was a no-no, but since I’m only using it for the dough-making and since your recipe doesn’t say otherwise, I thought it was a safe bet. You “should” be fine. I don’t use bread flour for this recipe. it worked perfectly, thanks! my girls had homemade cinnamon rolls for their first day of preschool then we took them to the church office so we wouldn’t be tempted to eat too many. my empty pan was returned the same day! i think they were a hit! next step… freezer method. Very yummy! I’ve made these twice and they’ve been a hit with the fam both times. However I did have to add about 1 cup more flour to tame the sticky dough mess that was climbing out of my bread machine pan. 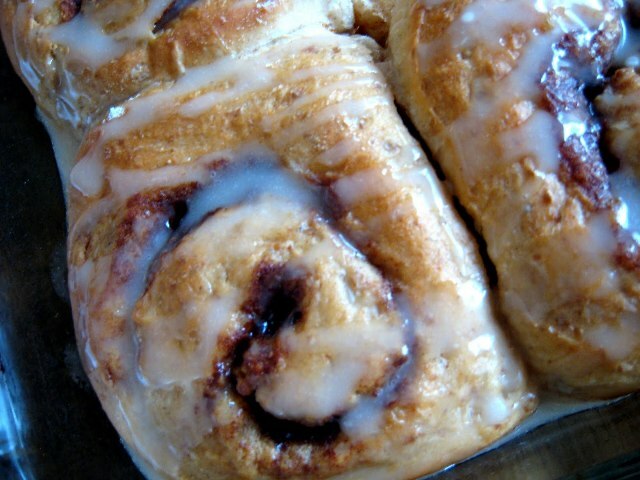 When you defrost your cinnamon rolls overnight – do you place them in the fridge or just on the counter? @Fleur, I have done both depending on how late I’m up, how late I want to sleep, and how hot/cold the house is. You want it to thaw and rise before baking. The fridge “should” be fine. Could these be made a day in advance then left in the refrigerator? yes, you can make them the night before and refrigerate. i have a lot of dough left can i put it in the freezer uncut? I make it all into rolls, so I’m not sure. If it hasn’t risen much, yes, you can freeze it. YUMMY! These were really good! Thanks! Is this recipe for a 1 or 2 lb bread machine? Wouldn’t have thought this to be important, but lets just say I found out the hard way that it is. Looks so yummy! Uh oh! Good question. I have a 2-pound machine. Just put them in. They absorb some of the liquid and cook when baked.